On their first release,Retrofitting, Number Three Combo explored a sound utilizing acoustic instruments like guitar, flute and hand percussion, with occasional synth to create both folky songs and more cinematic style soundscapes, often with a Middle Eastern flavour. On their second album, 2016’s Solarium, they explored similar territory, but they replaced the acoustic guitar with synthesizers for a much more electronic album. For Resurfacing, which is their final release, Number Three Combo shake it up again, this time producing a more traditionally song based album, without sacrificing the elements developed on the first two recordings. Returning for this outing are ex-Black Sun Ensemble members Eric Johnson on guitar, keyboards, and vocals and Joe E. Furno on flute and vocals, joined again by Cobracalia’s Carl Hall on djembe and dumbek. Assisting them on this album are former Cobracalia/Muddy Bug drummer Darin Guthrie and bassist Zac Seasley. the Stones flavoured teen high school stomp of Friends, and the rollicking yet strangely moody and spacey Fog and Steam. Laziness Is Next to Godliness, the longest track on the album at just over 6-minutes, returns to the more cinematic sound of their first two releases, with an atmospheric instrumental excursion in three distinctive parts that magically come together as a unified whole. You’ll also hear stirring ballads like the lovely acoustic and quite spacey Band Blues, the moody and fatalisticNot for Long, and the haunting Walking in the Air, a cover of a song from the popular UK children’s holiday classic The Snowman. Speaking of covers, I like that the band choose less obvious tracks to cover. Sure, everyone from Tom Petty to Haim have covered Fleetwood Mac’s Oh Well (Part I), but few if any have covered the lesser known Oh Well (Part II). The song dates back to 1969 when it was released as a single, with Part II as the B-side. Both parts were later added to a revised version of Fleetwood Mac’s 1969 LP Then Play On (also released in ’69). It’s a perfect choice for the band to cover as it delves into both traditional blues rock and classically influenced cinematic music. They preserve the bluesy vibe of the original Part I, but give it a bit of progressive edge with Furno’s furious flute playing and Part II is a beautiful and quite stately, acoustic meditation that adds soft synth swells for a haunting atmosphere. The album ends with Let It Play to the End, a rousing, melodic and joyous rocker (another of the truly standout tracks on the album) that segues nicely into the short final piece, End(less), a slow, swirling ambient fade out. 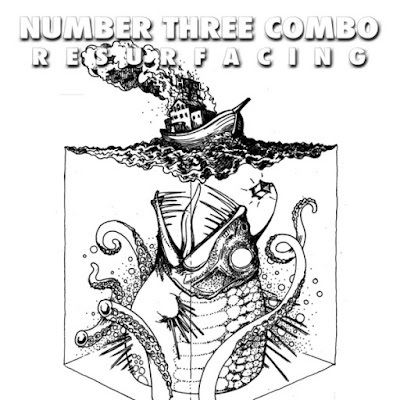 Over the course of their short career, Number Three Combo have left a legacy of fascinatingly varied musical ideas that nonetheless draw on the core power of the three main members giving it all a distinct and unique delivery. Resurfacing is less a summation of their sound, but more an addition to what had come before. But with songs like Not For Long and Let It Play to the End that echo the closing out of a story, Resurfacing is a fitting final chapter to the band’s saga, and just an all-round great listen. Multi-instrumentalist Eric Johnson has spearheaded Tucson, Arizona-based SlowBurn Records for three decades, and the label celebrates its 30th anniversary with the third and final release from Number Three Combo. Sadly, it also represents SlowBurn’s final release of original material, although Johnson promises to release archival material from label favourites like Black Sun Ensemble, Sun Zoom Spark, and many others. So fans of the label will have many new and interesting releases to anticipate, but we’ll take a few moments to rejoice and sing the praises of another fine musical biscuit from this heady quartet. NTC has always dazzled with its eclectic mix of folk, rock, electronica, and Middle Eastern influences and the latest is no exception. ‘The Diamond Mine’ combines flute, dumbek, and Moog to place you square in the middle of an eerie desert wasteland, flying across the sands. Johnson prepares you for your trip with the encouraging admonition, “Just think how high you will fly, wide awake in endless flight”. Musically, the arrangement will please listeners who recognize elements of Johnson’s earlier work with Black Sun Ensemble throughout Number Three Combo’s discography. ‘Killing Time’ ventures towards the rockier side of NTC’s repertoire and we all know what Johnson means when he sings “It’s better to trip and fall/than not to walk at all.” [Wink wink, nudge nudge!] ‘Heavy Is The Hand’ is heavy indeed, a stomping, trawling bluesy swagger, punctuated by Joe E. Furno’s forceful flutework. Next up we have a rather surprising interpretation of Howard Blake’s ‘Walking In The Air’ from the perennial holiday favourite The Snowman. Gone are the falsetto children’s voices, as Johnson and Co. bring the song back to Earth with seering guitar solos and throbbing percussives. ‘Friends’ adds a groovy Paisley Underground vibe to the fun, fondly recalling fellow desert dwellers Green On Red, but things then settle into more reflective territory with the subtle ponderable, ‘Not For Long’, wherein Johnson likens life (and record labels, no doubt) to “simple three chord songs that only hit after [their] gone.” NTC are big fans of Peter Green-era Fleetwood Mac and they turn in a blistering version of ‘Oh Well’, including its rare, more contemplative ‘Part II’ [from Then Play On], which is a virtual Johnson solo performance. The no-holds-barred arrangement (to Part I) rips the Buckingham-led rendition to shreds, with Johnson spewing the lyrics through a megaphone for full, disorienting effect. Fans of the band’s lengthier, freeform jams will certainly welcome ‘Laziness Is Next To Godliness” to their bosom, settling down with a nice cuppa and a smooth spliff and pondering whether that really is ‘Paint It Black’ trying to elbow its way into the party! The story ends with three Johnson solo pieces, the dreamy headnodder ‘Band Blues’ and the farewell couplet ‘Let It Play To The End’ (“This side is now over; we let it play to the end/So I fall with the sunset. Yes I made it through every day/ This side is now over; there is nothing more to play” sung over a strident arena-size backing and a chorus of angelic choir voices) and the lockgroove of ‘End(less)’, which hints at more to come. Like your favourite record, everything must come to an end and for now, this side, this album, this band, and this label are over. Catch you on the flip side, Eric. Hope you resurface soon!